Prayer – Don’t you want to enjoy it too? 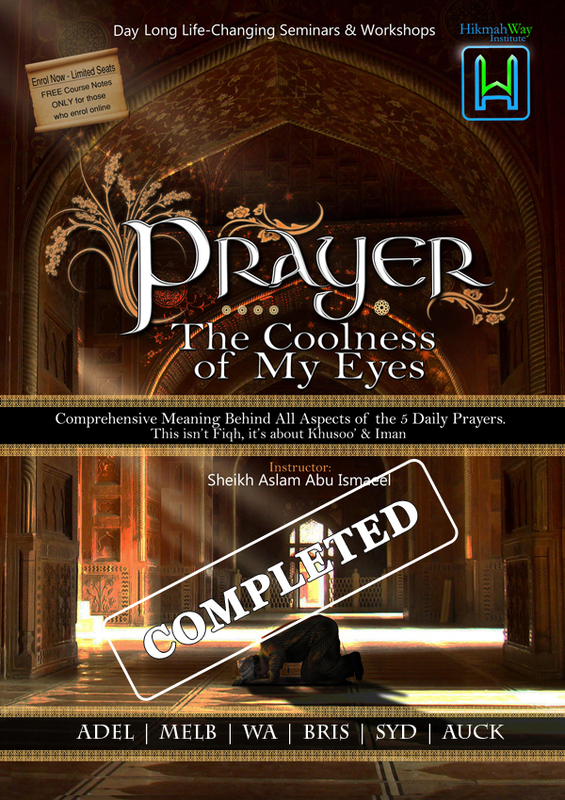 The Prophet S.A.W.S said that the “coolness of my eyes was made in the prayer“. The coolness of someone’s eyes (Quratu Ain) in Arabic is the greatest expression for what you love the most. That’s because when we pray, we meet with our Lord, we speak to Him and enjoy His company. The closer the prayer is to your heart, the higher your love is for Allah. Wouldn’t you like the prayer to be the coolness of your eyes too? It can be! Comprehensive Meaning Behind All Aspects of the 5 Daily Prayers. This isn’t Fiqh, it’s about Khusoo’ & Iman. Who is Ibn Al-Jawzi? Someone who really knew what he was talking about! Forget yoga, forget the spa, the prayer is where it’s at for the Muslim! Want to taste it too? Prayer: Coolness of MY Eyes. You may have your own way of relaxing, but we guarantee that it won’t come near what the prayer offers and we’ll teach you how. You won’t find this anywhere else!